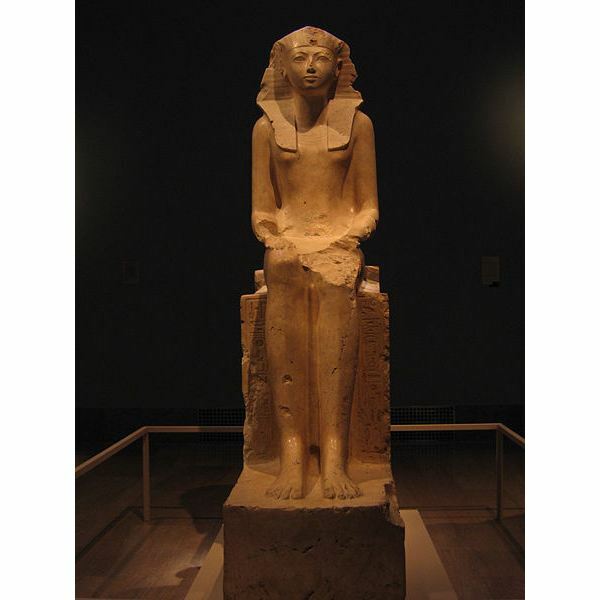 Hatshepsut Lesson Plan: What Were Women's Legal Rights in Ancient Civilizations? Hatshepsut Lesson Plan: What Were Women’s Legal Rights in Ancient Civilizations? Many people believe the first woman Pharaoh in Ancient Egypt was Cleopatra. While she may be the most famous female Pharaoh, she was definitely not the first. That distinction belongs to a woman called Hatshepsut, widow and sister (that’s right, sister) of Pharaoh Thutmose III. The lesson plan below looks at her reign and the rights women enjoyed in Ancient Egyptian society. This lesson plan is a brief independent or group assignment on women’s rights in ancient times. It requires the students to research the rights of women in various ancient civilizations and compare and contrast their findings to the rights of Ancient Egyptian women. Information on the legal rights of women in Ancient Egypt is provided below along with background on the Pharaoh Hatshepsut’s reign. Read the notes below as a class and discuss what life must have been like for women in Ancient Egypt. Remind students that good note taking during this discussion will be important to their research assignment. Using their textbooks, the Internet or school library, have the students research these ancient societies with particular attention to women’s rights in their assigned civilization and how they compared to the rights of Ancient Egyptian women. Students should also address the question of whether they believe a woman could have risen to power in the society they researched as Hatshepsut did in Egypt. Have students present their findings in an oral presentation accompanied by some sort of visual aid. For example, a PowerPoint Slide Show, video, or printed handout. Women in Ancient Egypt enjoyed rights women in other ancient societies did not have. Egyptian women could own property, live alone, and divorce their husbands. Some royal women even held the influential position of god’s wife and visited Amun’s temple regularly to leave offerings, perform rituals, and care for the god. God’s wives were prominent and well-respected in Egyptian society.The only other person who could interact directly with a god was the Pharaoh. However, Egyptian society had clearly defined roles for men and women. For instance, to have a woman as Pharaoh went against social and religious norms. Pharaohs were considered the sons of Amun and the living embodiment of the god Horus. In addition, having a woman as pharaoh went against ma’at, the word Egyptians used to refer to the natural order of the world. Hatshepsut was an exception and significant among the many important women throughout history.An Eighteenth Dynasty pharaoh who ruled for about 20 years, Hatshepsut was the first woman pharaoh in Egyptian history.Hatshepsut came to power when she served as regent for her step-son, Thutmose III who was three when his father Thutmose II died.Hatshepsut was Thutmose II’s half-sister and his wife. It was common for royal siblings to marry in Ancient Egyptian society. Such marriage ensured power, and succession to the throne, stayed within the family. Hatshepsut held the venerable position of a god’s wife. Following her husband’s death, Hatshepsut used her influence as a god’s wife to validate her power and began to assume the role of Pharaoh.She would often dress in men’s clothing and wear the crown of the Pharaoh to reinforce her position as Pharaoh. It also helped that she was an effective ruler. As Pharaoh, Hatshepsut concentrated more on trade than warfare. She sponsored successful expeditions to foreign lands, such as sending traders to Punt, which is now modern-day Somalia. Her traders brought back myrrh trees, ivory, and rare African woods. Like many other Pharaohs, Hatshepsut was also a great builder. Her most famous construction is her funerary temple at Deir el Bahri where she planted myrrh trees from Punt.It was a very popular tourist site among Egyptians of her own time.The designer of the temple at Deir el Bahri, Senmut, was rumored to be her paramour and the father of Hatshepsut’s daughter, Neferure’s. Karls, Farah, (2003). World History: The Human Experience. Glencoe-McGraw Hill.